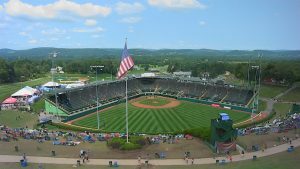 As the 2018 edition of the Little League World Series rolls into Championship weekend, the production and operations staff at ESPN look to add another feather in their cap after another year in Williamsport, PA. Although many of the production elements have remained the same from last year, Dennis Cleary, director, remote production operations, and Joe Rainey, senior remote operations specialist, have made some significant changes to the LLWS workflow. Lamade Stadium in Williamsport, PA, hosts the Little League World Series. With countless hours of game footage, replays, and other generated content, archiving can become quite cumbersome. With the typical 142 EVS channels, ESPN tapped into a Synology NAS selector to improve accessibility, dependability, and memory space. In years past, after the conclusion of International play, ESPN has always used the storing capabilities and extra resources from the production unit designated for Volunteer Stadium. This year, however, ESPN released the unit, relying solely on the power of two A units for the remaining games. With the Synology NAS, the crew can offload that content to that platform as a substitute. Now in its 10th year serving ESPN at the LLWS, Creative Mobile Solutions (CMSI) has a played a key role in these workflows. The company is onsite providing two Adobe Premiere edit systems; five Adobe Premiere producer stations; one 80-TB Avid NEXIS for edit storage; one 96-TB 10-Gb NAS for nearline storage; the Cisco 10-Gb network for edit and EVS workflow; and EVS IPDirectors, XFile3, and XTAccess. In working with CMSI, ESPN has the ability to scale and meet demand through virtualization of EVS software on VMWare, as well as the capability for high-speed file transfer to and from ESPN’s broadcast center in Bristol, CT.
With multiple games and two separate locations, communication is always a bit tricky at LLWS. This year, ESPN has transitioned from an RTS RVON intercom system to a UNITY system to provide more-seamless portability for the crew onsite. On-field audio, here a conversation between Hawaii Manager Gerald Oda and first baseman Mana Lau Kong, is a staple of ESPN’s LLWS coverage. For wireless communication this year, ESPN has brought in a Clear-Com FreeSpeak II system to handle all RF comms needs. The three mobile units are once again provided by Dome Productions: Pacific at Lamade Stadium, Journey at Volunteer, and B100XPT as the B unit. Camera coverage remains the same, with a combined 38 covering both venues. Major highlights include three Sony HDC-4300’s for super-slow-motion playback, three wired handhelds, one roving RF handheld, seven robos from Fletcher, five Marshall miniature POV cams, and a jib. When Volunteer closes up shop, Lamade gains an additional jib cam — right next to the Casey statue past the left-field wall. 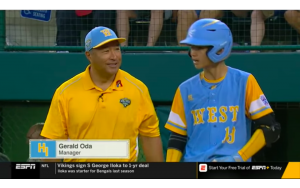 A staple of the Little League World Series is the capturing of the sounds on the field from players, coaches, and umpires. With an extensive arsenal of audio equipment, Cleary and Rainey are personalizing the participants with 72 effects mics, 22 talent mics, 16 RF mics (exclusively for coaches and umpires), and nine VER Hydras. Bexel laid down 50,000 ft. of fiber to make it all possible. As if the tremendous talent of youngsters weren’t enough, the New York Mets and the Philadelphia Phillies also participated in the 2018 Little League Classic. Although the pregame coverage and the telecast were handled by the staff of Sunday Night Baseball, Cleary and his team used TVU Networks IP transmission packs to capture the journey both teams undertook to get to the complex, as well as the fan interactions with big leaguers like Noah Syndergaard and Rhys Hoskins. ESPN has continued to expand and broaden its productions to bring this yearly spectacle to fans at home. Whether adjusting to the unpredictability and unknowns of late-August weather in Pennsylvania or conquering new technological challenges, the crew has remained committed to the essence of the tournament: the fun of baseball. As for Cleary and Rainey, the Little League World Series is one of the events that both men are always eager to return to.